Megaman LED PAR38 15.5W 2800K spots are part of the new 15,000hr Economy Series range, designed to enhance any lighting scenario at a lower cost than the LED Professional Series 50,000hr range. 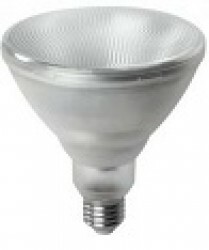 This PAR38 has an E27 base, and is a direct replacement for PAR38 halogen lamps where dimming is not required, in terms of both colour temperature and intensity, but with energy savings of up to 80%. The 15.5W PAR38 delivers huge energy savings, can pay for itself in less than 1 year, and may last for up to 15,000hrs. The perfect replacement for a 100W halogen.